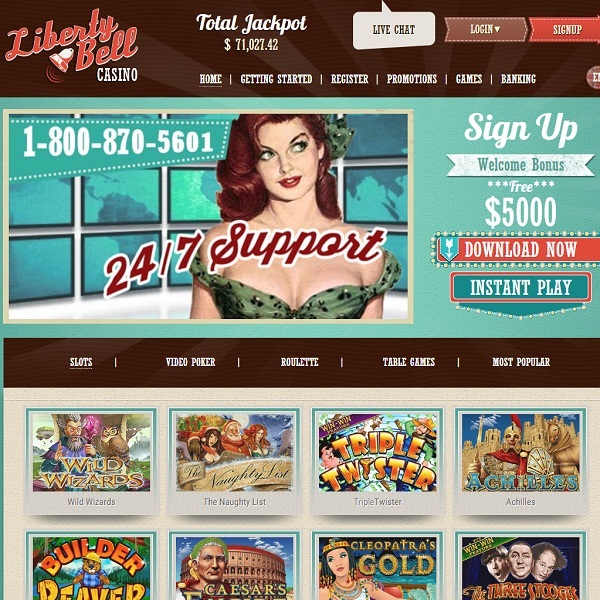 The newly launched Liberty Bell Casino appears to be the perfect destination for those that are looking for modern online gambling but with a vintage design. The casino offers games from Real Time Gaming and as such members have the choice of numerous titles. There are a number of video slots built on a diverse range of themes, such as Cleopatra’s Gold and Tiger Treasure, and many of them offer large progressive jackpots. Players will also find a good selection of video poker games, card and table games and more. One of the casino’s biggest attractions is the $5000 welcome bonus available to all new members which comes in the form of a 500% deposit bonus. Members can then enjoy numerous daily deposit bonuses as well as a highly rewarding VIP scheme which offers many more promotions and advantages.